It’s a name that I can’t stop recommending. 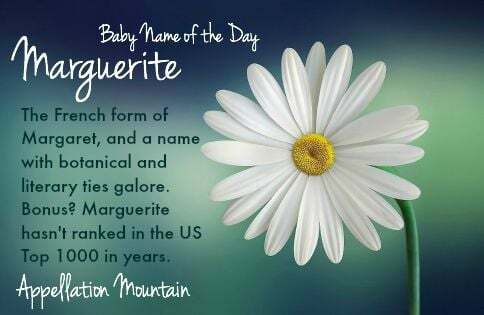 Our Baby Name of the Day is Marguerite. Maybe it’s not fair to call such an enduring classic back, because Margaret has been in use for ages. 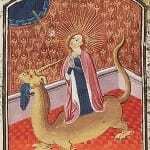 There was a popular fourth century saint, as well as royals galore. But the numbers don’t lie. Margaret ranked #169 in 2014, up from #180 the year before. 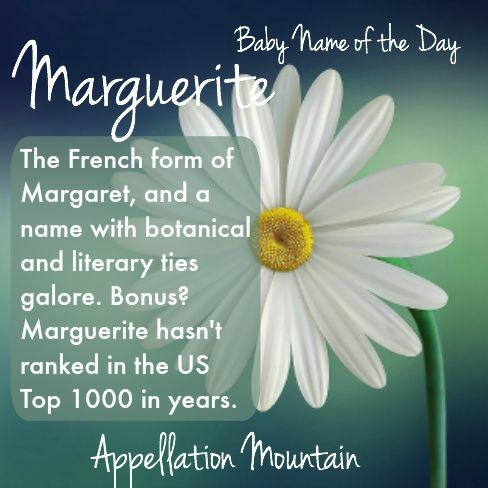 That’s a far cry from the name’s heyday, when Margaret ranked in the US Top Ten from 1880 through 1939.Marguerite is the French form of the name. The similar Margriet is Dutch, and Margarete is heard in German. 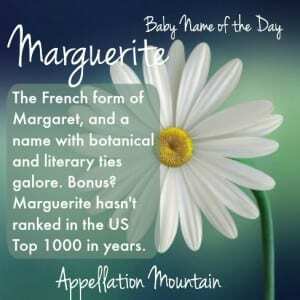 But Marguerite isn’t just the French form of Margaret. It’s also the French word for daisy, specifically the ox-eye daisy. In Greek, margarites is the word for pearl, ultimately from an older Sanskrit or Persian word. In Latin, it becam e the given name Margarita, which remains in use in Spanish and Russian. 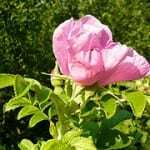 French writer Jean Molinet and Oxford-eductaed monk and poet John Lydgate connected pearls and daisies in their works. The accomplished Marguerite de Navarre, sister to future French king Francis I was a skilled diplomat, a friend to Erasmus and da Vinci. She used the daisy as her personal symbol. So did Margaret of Anjou, wife of King Henry VI of England. And so eventually the French word for daisy became marguerite, and Daisy became a playful nickname option for Margaret. It’s not just in French, either. During World War II, Queen Wilhelmina of the Netherlands took refuge in Canada. The daisy became the symbol of Dutch refugees, and when the queen’s daughter, Crown Princess Juliana, gave birth to a daughter in Ottawa in 1943, the princess was named Margriet. 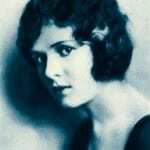 Marguerite ranked in the US Top 100 from the 1890s through the 1920s. But it’s been rare since. In 2014, just 73 girls were given the name. Faust gave the name to his heroine in Faust, the young woman saved by her inherent goodness. In some adaptations, she’s known as Gretchen, but Gounod’s opera and other works went with the formal name. Alexandre Dumas’ La Dame aux camelias was a tragic tale about a courtesan by the name. It’s the basis for La Traviata, but the character was renamed Violetta. In English adaptations, she’s usually called Camille. Novelist Marguerite Duras and French actress Marguerite Durand. It was the birth name of the poet we know as Maya Angelou. Marguerite Scypion was a slave in the early eighteenth century who successfully sued for her freedom. Scypion argued that her mother’s Native American heritage made her legally free. The court agreed. A point of trivia: in Drew Barrymore’s Cinderella-esque 1998 movie Ever After, the wicked stepsisters were named Jacqueline and Marguerite. The name is one-part Genevieve and one-part Josephine, but rarer than both put together. Given our enduring affection for French names, and a growing appreciation for the classic Margaret, it’s easy to imagine Marguerite fitting right on a playground today. From Maggie to Daisy to Gigi, there are dozens of potential nicknames if you prefer to shorten your daughter’s name. But at three syllables, Marguerite doesn’t require a nickname, either. If you’re after a name that feels rare and classic at once, this is a name to consider. 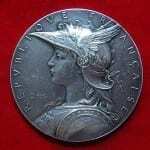 What do you think of Marguerite? Do you prefer Marguerite or Margaret? I love this name and just learned it’s a family name (on my husband’s side). Now it’s a strong contender for our daughter due in two weeks! What a treat to see this today! My daughter is one of the Marguerites born last year! It was the name of my great grandmother’s sister, who was born around 1900. 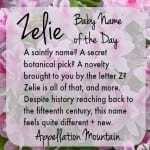 We absolutely love her name and its flowery meaning. The only downside is that it’s a long name–at 10 letters, I can imagine that she will not like that aspect when she is learning to write her name. I assumed that we would use a nickname but nothing has seemed to fit so far. In all, it’s a fantastic choice if you’re looking for a name that is very rare but very recognizable and familiar, and doesn’t have to be shortened if you don’t want! This was my great great grandma’s name! I like it a lot more than Margaret personally, but Margriet is probably my favourite variation. My favorite Marguerite is Marguerite Blakeney the heroine of the Scarlet Pimpernel. She’s been played by Merle Oberon in 1934 (opposite Leslie Howard! Gone with the Wind’s Ashley Wilkes!) and in 1984 by Jane Seymour opposite Sir Ian McKellen. The 1997 musical has amazing songs too. Though Marguerite doesn’t get to sing most of the really good ones. To be fair, McKellen played Chauvelin, the bad guy. Anthony Andrews played the pimpernel. Marguerite’s literary attachments were one of the appeals for me, though it’s also a family name.